It’s late afternoon. You are finally at home after a long day, and are relaxing on the couch. Someone comes to your front door. You answer the door and this normal looking young man is there, and says that he represents a window company. They are looking for homes in your neighborhood to install new energy saving windows, and then showcase your home as part of their advertising. In return for allowing your home to be a showcase, you will get a significant cost savings on the project. Nice looking guy. Official looking clip-board, ID badge hanging from his neck, clean cut. And this is such a good deal! How can you pass this up? This may be a legitimate sales call. Or this may be a scam. You are a little hesitant because perhaps you don’t want to start this type of major project right now, or maybe money is a little tight. The sales pitch is now being laid on thicker and thicker to convince you that you really need to consider this. Did you catch the scam? Before I tell you what it is, let me give you a hint and tell you that these scams are kind of like “sleight of hand” gimmicks in that one thing is used to distract you from the real purpose of the “mission” that this person is on. And yes – I used the word “mission” on purpose to give you a hint. Any thoughts yet? OK – here it is. This is possibly a reconnaissance mission. Reconnaissance to look for targets for home invasion and/or burglary. The thick sales pitch was a distraction from the other subtle things being asked, such as for you to give them a landline phone number. And if you’re thinking about your house windows and energy savings, you aren’t thinking about looking for what other pieces of information this person is collecting during this visit. First, by going door to door, our “salesman” gets to write down street addresses and house descriptions. That official looking clipboard is for taking notes, after all. A salesman writing down notes looks perfectly normal. They get to see if anyone is home at that time, they get to see who answers the door (man, woman, child), they can now tell which houses have dogs (as alerted by the doorbell), and they can also see which houses have alarm signs in their front yards (and/or stickers on the door). If a person answers the door, besides seeing if an adult, man or woman, they can see what “type” of person it is: Stern, timid, mad, happy, geeky, forceful, easy to convince, skeptic, gullible, etc. All of these characteristics can help the thieves decide if that person will present a threat to them even if they are home during a potential home invasion. They now also know what other threats to their success exist at that house. Secondly, they asked specifically for a landline phone number. Why do you suppose that is? Well, if they have a street address, and can then associate a landline (hard wired) phone number to that address, they then have some pretty concrete exploitable information about your physical residence. Then the next part of the reconnaissance begins. Several calls can be made to that landline to see if anyone is home at various times of day, find out who is home at those times (did an adult or children answer the phone? 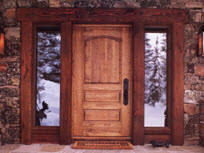 ), and start putting together a pattern of the most opportune times for an invasion or burglary. If someone answers, it is easy to fabricate a story for why they are calling. It is also extremely easy to spoof the phone number for the caller ID, or simply make it appears as "Unknown." Associating a landline with a home with an alarm system also gives the thieves an opportunity to figure out which methods they need to use to defeat or circumvent the alarm. For starters, you are not obligated to answer your door. But to help you decide whether or not to answer, consider installing a wide angle peep hole in your door so that you can see a wider area of your front entry area. Only allow the adults in your house to answer the door. Tell children that under no circumstances are they to open the door to anyone. If you are going to answer the door, take a moment to compose yourself, put on your game face, and prepare yourself to question everything about this person standing at your doorstep. You don’t need to verbalize every question, but don’t get so caught up in the sales pitch that you forget to keep asking yourself why they are here, what red flags should be going up, and what general suspicions you have about them. Put a “No Soliciting” sign on your front door. Where I live, it is against the law to make unannounced house sales calls like this if there is a “No Soliciting” sign posted. Maybe this will keep them away and help avoid the whole situation entirely. If it is a legitimate sales person, they know about the laws, and will probably honor it. Criminals don’t know or care about laws. If they won’t honor that “no Soliciting” sign, that should be a red flag. Do NOT give them your home (landline) phone number under ANY circumstances. I personally would be hesitant to even give them a cell phone number. Ask for the company's phone number and tell them that YOU will initiate any call for service. Ask for more official identification (such as a driver’s license) to compare to that neat looking little ID badge they have hanging from their neck. Write down who they are, what company they claim to be from, and even ask for a business card. If they have no business cards, that should also be a red flag for you. Answer their questions with conviction. Don’t waffle or look like you are unsure of yourself. But keep your answers short and direct. Don’t give out information about you or your household. If you are not interested in the sales pitch, state as such directly. Again – tell them YOU will initiate contact with their company if services are desired, and after you have verified the legitimacy of their company. After you close the door, write down everything you can remember about them. Time, date, height, weight, race, hair color, clothing, what they were carrying, name from identification. Were they on foot, or did they drive up in a vehicle? If a vehicle, write down a description and license plate number, if able. Did they seem nervous? What was their general demeanor? If you have an alarm system, explore whether or not cellular technology is available for the monitoring portion of the alarm, or consider switching to an alarm company that does offer cellular technology. I have looked into the “SimpliSafe” alarm system, for example, and will be switching to that from ADT. (I will write a separate review once installed). It may be a legitimate sales call, or they may be sizing you up for burglary or home invasion. Absent your crystal ball or superpowers for predicting the future, you have no way of telling. If it is for criminal purposes, you have to remember that they are sizing you up and doing risk analysis on you and your home. They don’t want to get hurt “on the job” and they don’t want to go to jail. It is your job to size them up also, try to see the red flags, and do your own risk analysis and threat management. Ultimately, you need to do whatever is possible to make your home an undesirable target for them. If you can get them to move on and eliminate you as a target quickly, then that is a very good thing. NOW HEAR THIS...NOT ALL THIEVES ARE STUPID!! Some people left their car in the long-term parking at San Jose Airport while away, and someone broke into the car. Using the information on the car's registration in the glove compartment, they drove the car to the people's home in Pebble Beach and robbed it. So I guess if we are going to leave the car in long-term parking, we should NOT leave the registration/insurance cards in it, nor your remote garage door opener. them. If you don't reach them, be very careful about going places to meet 'family and friends' who text you. There are four fundamental safety rules that we consistently teach in our firearms classes: 1) The gun is always loaded until you have verified otherwise; 2) Always keep the muzzle pointed in a safe direction; 3) Keep the finger off the trigger until ready to shoot; 4) Know what is behind your target, and between you and the target. These rules apply to target shooting, and they also equally apply to tactical situations and defensive shooting. Even if you are clearing your home to look for intruders, for example, you need to ALWAYS be cognizant of these four things while looking for the bad guy. And if you are in this situation, I hope your gun IS loaded. So let's focus on the third safety rule for a moment. Why is it that we teach keeping the finger off the trigger until sights are on target and you are ready to shoot? When a person is startled, the natural response is to blink, lean the body forward, bend the arms at the elbows, and clench the fists/fingers. When clenching the fists happens, each clenching finger is able to exert about 25 pounds of force. It only takes about 12 pounds of force to pull the trigger of a revolver in double action mode (hammer down). If your finger is in the trigger and you are startled, you will pull the trigger. If that happens, think about those other safety rules for a moment. Where is the gun pointed when the shot goes of? What is in the line of fire when that happens? Proper trigger discipline is crucial to ensuring that you will be safe whether at the range or in a defensive situation. Proper trigger discipline is also a matter of building up muscle memory through practice. 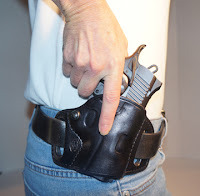 Beginning with the very first movement of the holster draw, the trigger finger should be indexed along the side of the firearm the minute the hand is placed on the grip of the gun. When at the low ready, the high ready, the retention position, or at the fully extended position, the finger needs to be indexed on the side of the frame. 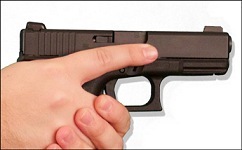 Only when you have a target in sight and you are ready to shoot does the finger move inside the trigger guard. Then simply touch and press the trigger. Defensive shooting is every bit a matter of safety as it is efficient, tactical movement. Practice, practice, practice. Practice indexing that finger, and practice moving the finger to the trigger. Safely done, dry fire is a key training tool in these methods. Today’s news included a story about presidential executive orders signed to help satisfy calls for gun control. One of these measures included an order to prevent importing US military weapons back into the country. The idea for this order is to prevent more of these “military grade” guns from getting onto our streets. Many of these guns could very well include M-1 Garand semiautomatic rifles that are bought and reconditioned by the Civilian Marksmanship Program (CMP), and then sold to people who participate in legitimate marksmanship programs such as the “Appleseed Project” which is put on by the Revolutionary War Veterans Association (RVWA). The rifles are also collector’s items owned by legitimate and law abiding gun collectors. For the purposes of this article, by the way, I am limiting discussion to these and similar rifles. Any other military grade weapons are probably already restricted from civilian ownership anyway. Well, you know what? I am sick and tired of this worn out phrase where the gun grabbing community says they are doing something "to get guns off the streets." Really? Off the streets? What do they mean by that? Are there guns running around on our streets committing crimes? “Get these guns off the streets” is the cry that I seem to hear all too often, but as I wrote in an earlier blog post about a lack of understanding about gun terminology, I suspect, too, that there is a lack of their own understanding about guns “on the streets.” To be perfectly blunt, I am relatively certain that the phrase “on (or off) the streets” is a pejorative term meant to indicate anything that relates to common citizens, and those who aren't the “beautiful and politically influential people.” I think that they consider any gun to be in the hands of law abiding citizens to be included in this “guns on the streets” rhetoric. But let's say just for a minute (giving them the benefit of the doubt), they mean that “on the streets” refers only to the criminal underworld and the gang element, and they simply want to get the guns out of the hands of these criminals, then they need to try again. There are already laws for that. What they need to do is start enforcing these laws. Preventing collectors and the CMP from getting these rifles does not help this situation. It only penalizes these law abiding folks. Many of these weapons that come back from overseas are in poor shape. The CMP buys huge numbers of these things, and cannibalizes them for parts to make enough good rifles to sell to RVWA members, collectors and others. This is an expensive process, and quite frankly, I don’t think the thug gang members have the skills to do this. So when I hear a gun control proponent say that they want to get the guns "off the streets" I can only assume that they actually mean that they want to get them out of the hands of EVERYONE! Sorry – but I am not giving them the benefit of the doubt. I have seen the gun grabber heart in action too many times. Gun control efforts are continuously aimed at making it harder for law abiding citizens to acquire that which is already constitutionally protected, and do nothing to prevent criminals from getting them. When the founders wrote this amendment, it was their intention that common citizens would arm themselves and be able to contribute to the security of the community. They meant for all citizens to be trained and know how to use those weapons as well. These people need to spend more time reading their constitutions (I've got a whole box of pocket constitutions if they need any) and enforcing already existing laws, and less time worrying about how to tie the hands of law abiding citizens.